Geetha Govindam starring Vijay Devarakonda and Rashmika Mandanna has collected $204,955 at the US box office on Sunday, taking its five-day extended first weekend total to $1.55 million. Geetha Govindam starring Vijay Devarakonda and Rashmika Mandanna has taken the US box office by storm in the first weekend with its five-day collection surpassing $1.5 million mark. Arjun Reddy and Pellichoopulu had minted $1,777,900 and $1,223,000 respectively at the US box office. 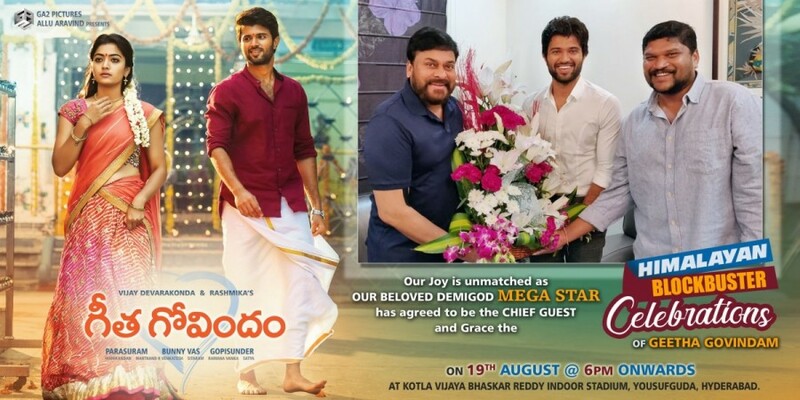 Their success had created a lot of hype for Geetha Govindam. The hype and promotion helped the film register good advance booking for the premiere shows, which were held on Tuesday, a day before the movie hit the screens in India. Geetha Govindam opened to fantastic response and collected $400,092 from around 160 screens at the US box office in the premiere shows. The movie garnered positive reviews, which helped the movie's collection following days after its release. The film went on to create a new record by crossing the $1 million mark in the US within four days. Idlebrain Jeevi‏ tweeted, "#GeethaGovindam is unstoppable in USA. It collects a gross of $354,769 on Saturday (18 August) from 143 locations with per location average of $2,481. Total gross in USA so far is $1,340,075. It will cross $1.5 Million mark on Sunday! Fantastic, [sic]"
According to reports, Geetha Govindam collected $204,955 at the US box office on Sunday, taking its five-day extended first weekend total to $1,545,030. This number is likely to go up when the final figures are out. Idlebrain Jeevi‏ tweeted, "#GeethaGovindam hourly USA gross at 10:10 pm PST on Sunday is $204,955 from 134 locations Crossed $1.5 Million already and now total gross turns out to be $1.55M. Fantastic [sic]"
Within five days, Geetha Govindam has emerged as the fifth highest-grossing Telugu movie of 2018 in the US. The Vijay Devarakonda and Rashmika Mandanna starrer has beaten the lifetime collection records of Manam, Aagadu, Dhruva and has become the 21st highest grossing Telugu film of all time at the US box office. Here is the list of top 30 highest-grossing Telugu movies of all time in the US. The numbers are based on different sources and they may vary from the actual numbers released by its distributors or makers. All the figures are in dollar and million.